Hand-crafted using over 500 parts. From the custom pump panels to the Arrow XT etching, each 1:50 scale replica is built to the exact specifications of Engine 32. Our goal with each release is that our customers may notice something new each time they view the model. Countless hours of design, proofing, and improvements make this replica museum grade. Hundreds of individual, razor sharp stainless steel components create realism never before seen in a fire truck scale model. 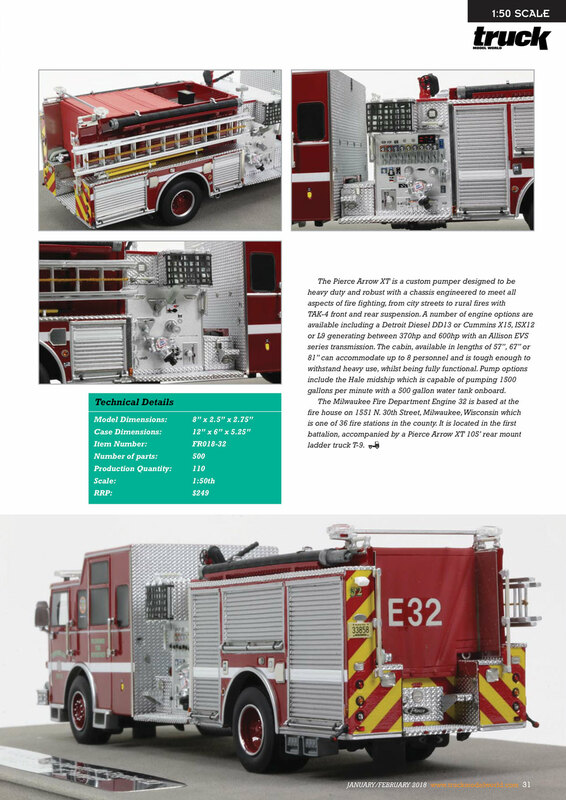 Production Engine 32 is limited to 110 units. Fire Replicas are designed with the elite collector in mind, and manufactured in limited quantities to enhance future value. Milwaukee Fire Department Engine 32 measures 8"L x 2.5"W x 2.75"T and is securely displayed inside a custom case. The case dimensions are 12"L x 6"W x 5.25"T and the platform includes an etched stainless steel nameplate with the Milwaukee Fire Department seal, department and truck name. 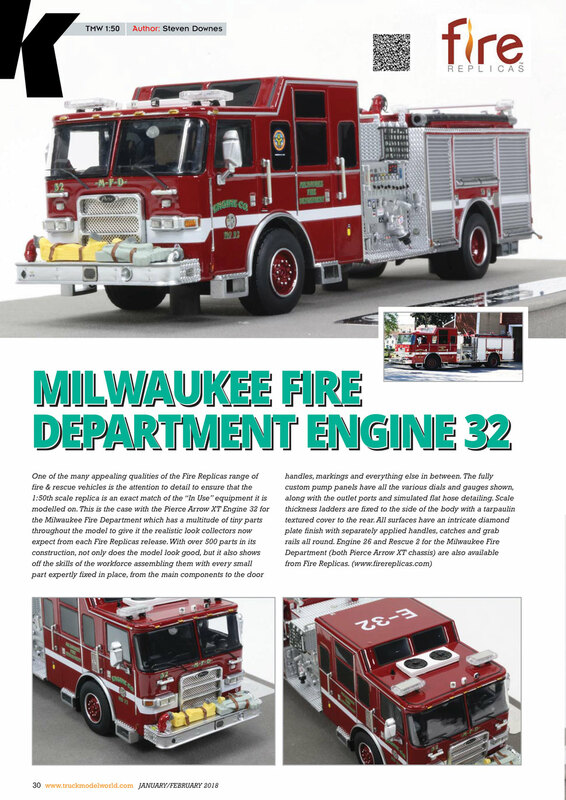 This Milwaukee Fire Department Engine 32 scale model is a museum grade replica. Like all Fire Replicas models, every detail is modeled to perfection and with razor sharp precision. The replica features the specific department configuration and graphics, leaving no detail overlooked. The display case is custom manufactured with high quality acrylic and resin. The stainless steel etched plate features the department seal, and the department and truck name. This replica is a treasure to be displayed and admired and is in no way a toy. As the Captain assigned to M.F.D. Engine 32 for the last 2 years, I can tell you that you hit the money on the mark. Every detail on our actual rig is captured in the model, even the "Milwaukee style lettering." Keep up the outstanding job of representing the fire service with your high quality models. I have ran out of superlatives to discuss the Fire Replicas product line. These models are superb and accurate-to-scale masterpieces. The Milwaukee Pierce Arrow XT E26 and E32 are no exceptions. These are even better than the photos indicate. Beautiful smooth paint finish, crisp markings and accurate diamond plate are just the beginning. The emergency lights look great, as does the monitor and the beautifully replicated ladder. Either or both of these engines look fantastic next to Fire Replica's Milwaukee Rescue 2. There is no reason not to buy one or both of these engines!